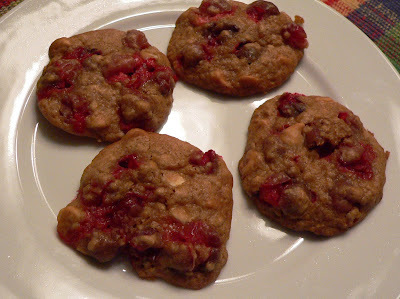 I found this recipe for cookies using fresh cranberries on the Coconut and Lime Blog. I used regular-sized white chocolate instead of chocolate chips. I went to Williams-Sonoma to get the vanilla paste. As far as I can tell, regular vanilla would work just as well, but the paste is pretty darn fun. I really liked these cookies. HOB had trouble with the intensity of the cranberries. I don't like that kind of weakness in man, but he has other good qualities, so I am willing to overlook this for the time being. Preheat oven to 350. Line 2 cookie sheets with parchment paper. In a large bowl, cream together the butter, vanilla and sugar. Add the egg, beat until fluffy. Add the flour, baking powder, salt, ginger, and oatmeal. Mix until well combined. Fold in cranberries and chips. Place 1 tablespoon sized blobs of dough on the cookie sheet (about 1/2 inch apart) and bake for 12-14 minutes or until they look "set" and the bottoms are just brown. Carefully, remove to a wire rack to cool completely. Oh, my Gawd! I can taste them from here! Oh yes! More converts! Go my Cranberry Army!! !